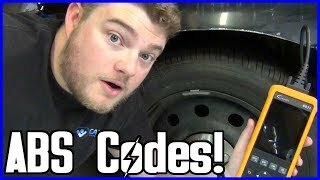 These sensors are not too difficult to replace and will take you about an hour and the part will cost between $35 and $210 depending on the sensor. To find the sensor you will need check on Amazon or visit the car dealer or local parts store. 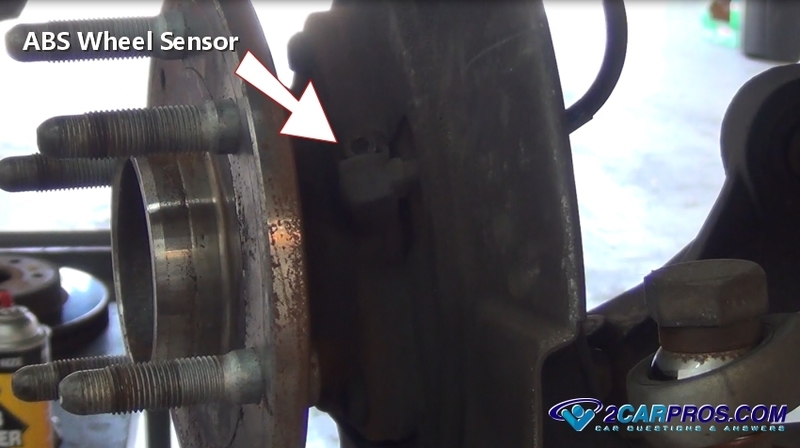 Some sensors can be removed separately while others are integrated into the wheel bearing hub assembly which is what we have shown in this video. Please watch the video below to give you an idea what you are in for, and then continue down the guide to gain additional tips and information. You will need to jack the car up to remove a tire or replace a control module and we prefer you learn how to do it correctly. Through this guide you will need to remove a tire for part replacement purposes. 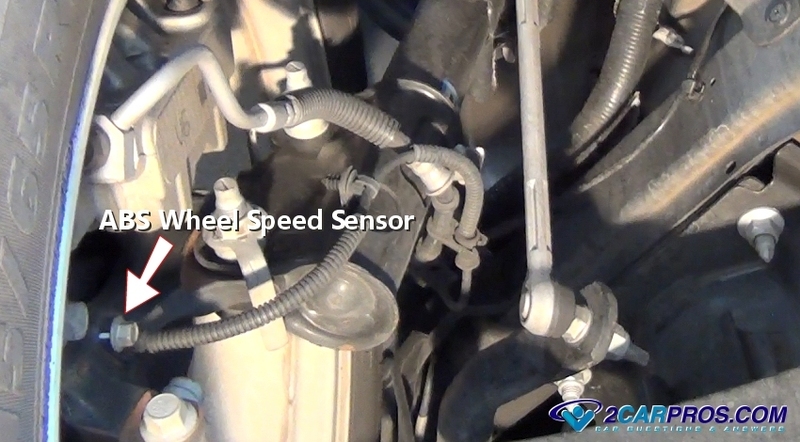 The brake caliper and brake pads will need to be removed when replacing a wheel speed sensor. 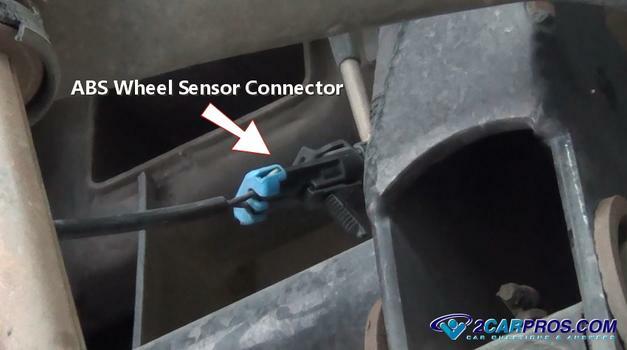 This sensor simply bolts into the rear of the spindle and easily disconnects from the wiring harness near the frame. Here is a sensor after the rotor and caliper has been removed. Be sure to inspect which style of sensor configuration your car has before beginning the job. Use a socket or wrench to remove the sensor mounting bolt which can be an Allen, hex or torx head bolt. These bolt sizes are usually 10mm, 11mm, 25 torx or 8mm Allen head. 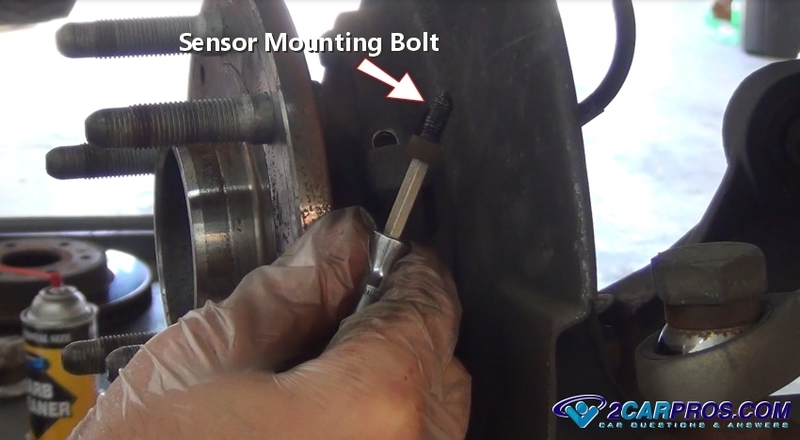 After the mounting bolt has been removed grasp the sensor to remove it from the bearing hub or spindle. While the sensor is removed inspect the stator ring using a flashlight while rotating the hub to confirm there is no damage to the ring. Match the new sensor to the old unit to ensure proper installing and operation. Confirm the electrical connector is clean from dirt and grease before reassembly. Once the sensor has been replaced the ABS warning light should go out without resetting or clearing the codes in most cases. Some older systems such as Nissan or Volkswagen might require a scan tool to reset the system, but this not typical. Be observant when first driving the vehicle after the sensor replacement. Listen for abnormal noises or performance issues that could indicate a problem which will need further inspection. No code clearing is required in most cases for American built vehicles. Some older European and Japanese models may need to be cleared using an ABS code reader. If the warning light remains on after code clearing it means you still have a problem. If you have any questions about ABS brakes visit our forum. You will also need replacement parts such as the wheel speed sensor, computer module or system fuses. We have created a guide that will inform you as to where to go to get the best deal and quality.